KEY FEATURES: Fleshy herb with ascending, strap-like leaves to 100x8cm. 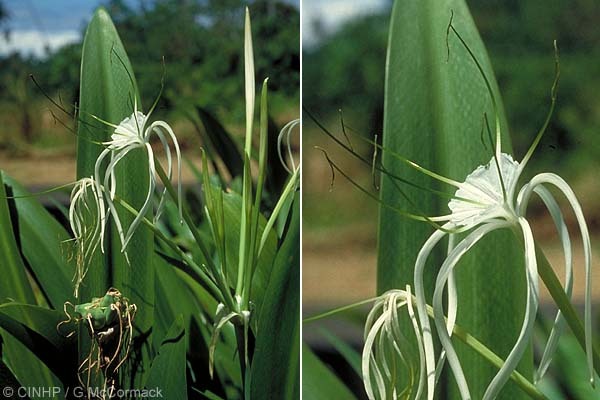 FLOWERS stalk to 90cm with terminal cluster of 4-10 flowers; each with slender green tube to 10cm, with 6 slender, white petals to 10cm; stamens green to 7cm, joined at basally by a white, funnel-like staminal cup to 3.5cmØ. 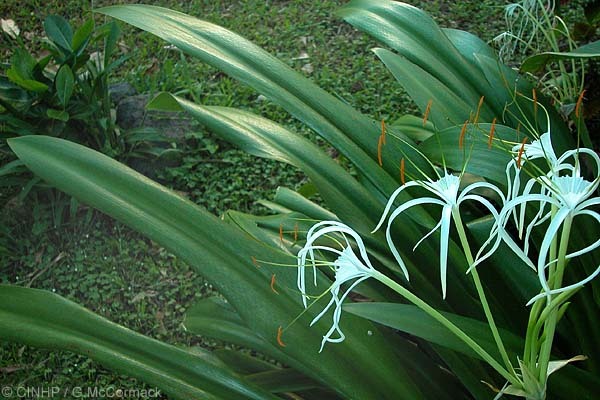 Hymenocallis littoralis differs in having staminal cup resting on the petals (vs. clearly separated); leaves to 4cm wide (vs to 8cm). IDENTIFICATION: Herb to 1m. LEAVES basal, fleshy, dark green, lancelike to 100x8cm. FLOWERS on stalk (=scape) to 90cm; 4-10; ovary with 3 cells each with 4-6(-8) ovules (only one forming a seed), green; corolla tube green, 15x0.5cm; petals (=lobes or tepals) 6, white, straplike, 10x0.5cm; staminal cup NOT pressed against petals, funnel-like flaring to 3.5cmØ; stamens 6, to 7cm, white in cup and 1cm beyond then green; style protuding 10cm, green. 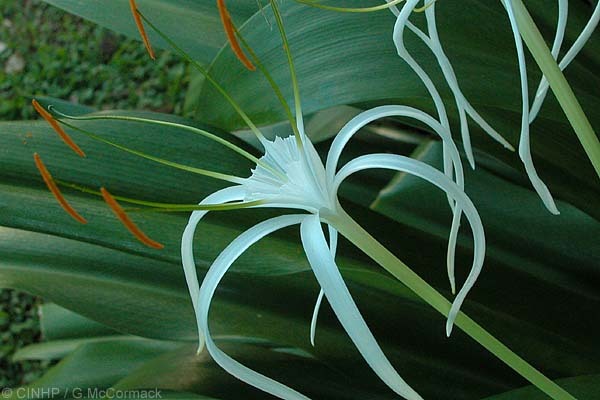 Rarotonga: fieldspecimen+photo, east Arai-te-Tonga, 2003-4, G.McCormack ID as Hymenocallis littoralis in 2003, changed to Hymenocallis pedalis 2004 on reconsidering ACSmith 1/158 and his change 5/583.